THAT 👆🏻 right there is any cookie lover’s dream! 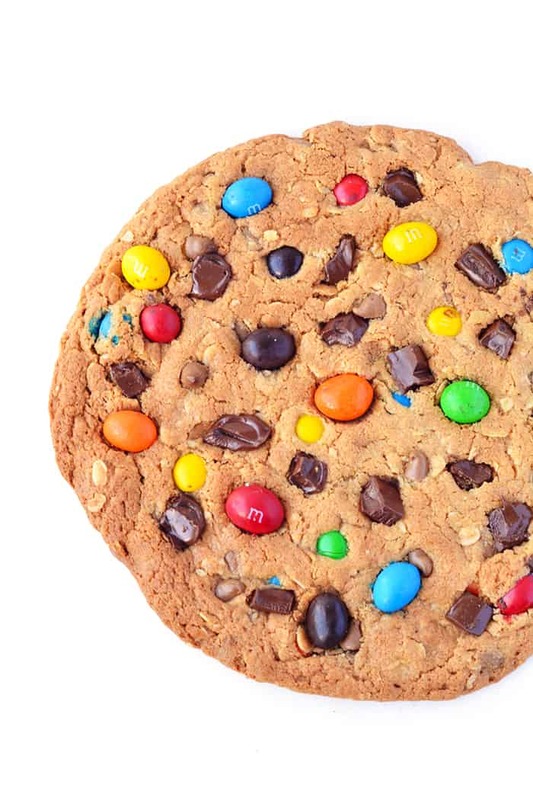 A GIANT Monster M&M Cookie that’s literally as big as your face. It is also the fourth cookie in my giant cookie series. And it could be the best one yet! 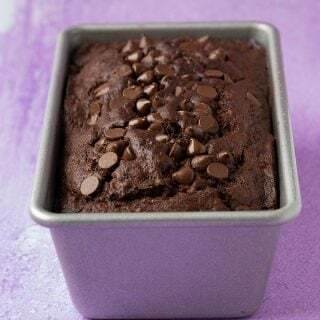 It’s big, it’s beautiful and it’s filled with chewy rolled oats, crunchy M&M’s and a boatload of chocolate chips! What more could you want? 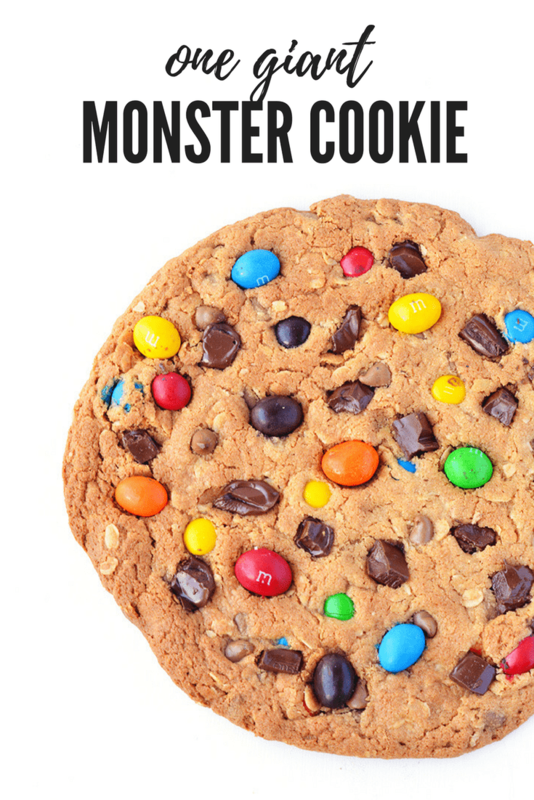 If you love Monster Cookies (I know you do), you will love this cookie! It took me so long to get this recipe down pat. I made it 5 times last weekend – there were cookie crumbs and M&M’s flying all over my kitchen. With the added rolled oats, it took a while to get the texture right. First it was too thick and dry, then too thin. But I finally got there. 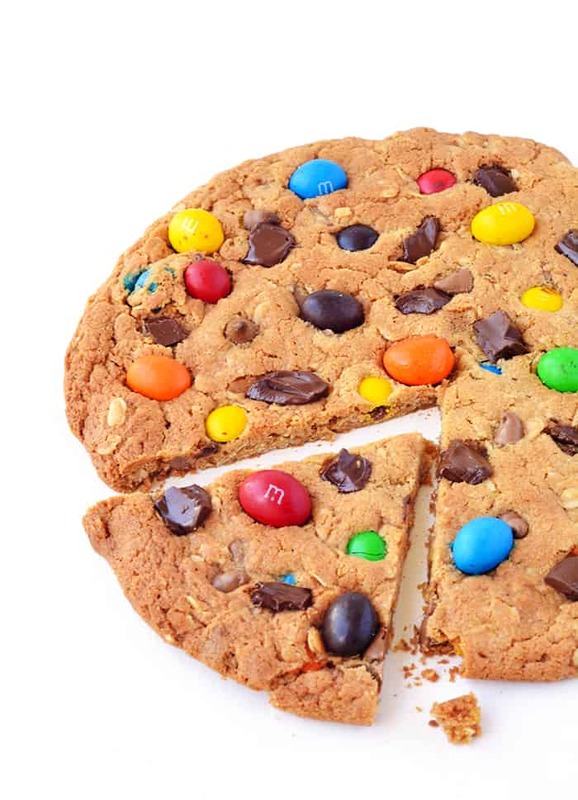 This giant Monster Cookie has thin and crispy edges, a chewy centre and heaps of candy and chocolate in every bite. Of course, I couldn’t just use regular M&M’s, I also added a few peanut M&M’s because, well, life’s too short! The best part? No need to chill the dough. No electric mixer needed. And no time spent rolling the dough. This recipe is easy with a capital E. And that’s the way we roll around here. Easy and downright delicious. 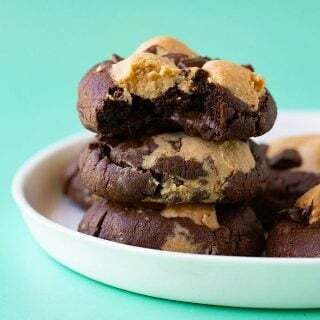 Once you mix together the cookie dough, you simply spread it out onto an oven tray and bake. That’s it! A thin and crispy cookie, with plenty of chew from the rolled oats and saltiness from the peanut butter. Plus there’s all the chocolate chips and M&M’s! Do I need to say more? If you can’t get enough of giant cookies, don’t forget to try the other varieties here on Sweetest Menu. There’s my Giant Triple Chocolate Cookie with so much chocolate goodness, and my Giant Peanut Butter Chocolate Chip Cookie, which is sweet and salty and completely irresistible. These giant cookies also make for awesome presents! Never mind making and frosting a cake. Just bake one of these giant cookies, wrap in cellophane and gift them to your friends. 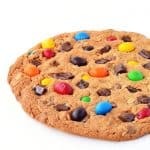 I know I would LOVE to receive a giant cookie! But don’t forget to bake one for yourself too! 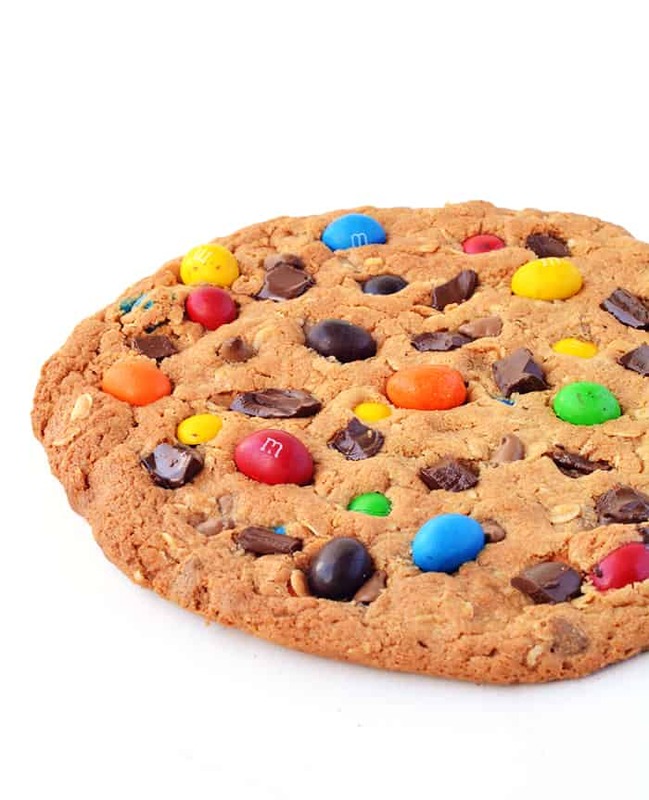 One Giant M&M Monster Cookie filled with chewy rolled oats, peanut butter, crunchy M&M’s and a boatload of chocolate chips! Preheat the oven to 180 C (360 F). Line a cookie sheet with baking or parchment paper. In a large mixing bowl add your butter and pop it in the microwave for about 20 seconds or until just melted. Add your brown sugar and caster sugar and give it a stir. Then add your peanut butter and stir. Add egg yolk and vanilla extract and stir. Add your plain flour, baking soda and rolled oats. Then add the chocolate chips and M&M’s. Stir until a soft cookie dough forms, then transfer the dough to your cookie sheet. Flatten the dough and spread it out to form one large cookie. Press a few extra chocolate chips and M&M’s on top. Bake for approximately 12-14 minutes or until golden brown. 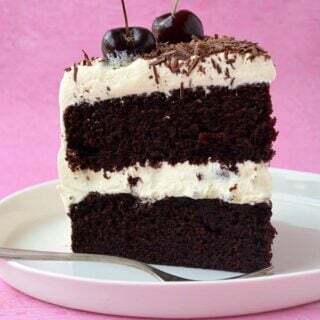 Leave to cool completely before enjoying! Way to go for sticking with this recipe because this looks PERFECT! 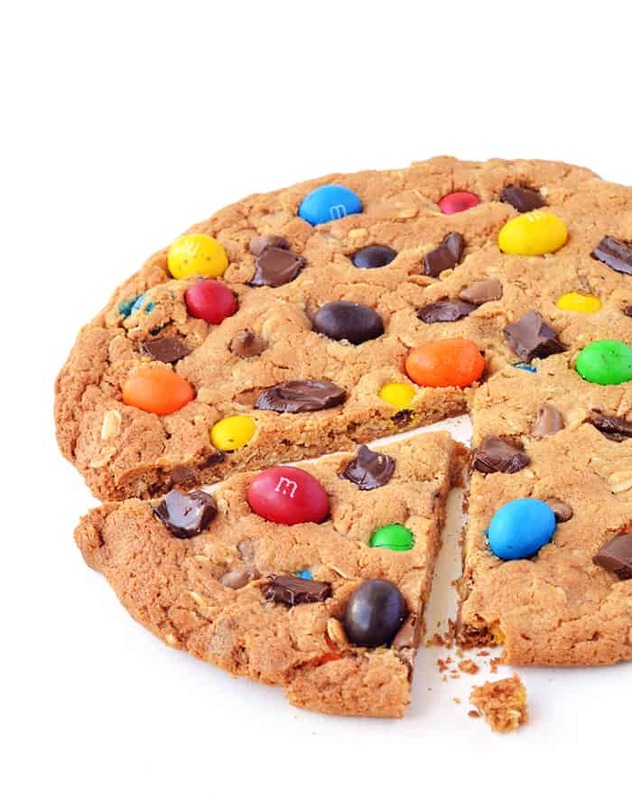 And giant cookies are definitely any cookie lover’s dream!